By his critics, he's labelled as a cold-hearted type of a filmmaker. That's despite the fact that his body of work has garnered, throughout the years, Mr. Christopher Nolan praise, fame, money and most importantly respect in the business of film-making. His work, often bashed, for it is heartless or lacks the emotion. But, Mr. Nolan hasn't looked back ever since Memento put his name on the map. He keeps coming back with picture after picture, all astonishingly better than the other. Most are original and a few not. The few that are not, are based on the famous DC Comics character of Batman. Though, he still has injected in them a sense of freshness and originality. That's one of the most important reasons The Dark Knight trilogy looks and feels different. Finding a room in the hearts of millions of strangers is not a mission one should have in mind when he or she is set to make films, write books or sing songs. To reach such level–to be admired by millions and only your name is the reason to sell tickets is not an easy task. Indeed, it was not intentional when it comes to Mr. Nolan earning such status. Success demands patience, a unique voice and perspective. Successful also means to maintain your success. Cold-hearted is perhaps a bit of a harsh term to utilize, but the critics of Mr. Nolan themselves are cold-hearted. Blockbusters, almost all of them, that's 98 percent, tend to be heartless. Viewers pay to see these blockbusters in order to experience the spectacle. In terms of these blockbusters, plot, character and logic does not matter. The very critics of Mr. Nolan tend to praise these blockbusters. Though, blockbusters are good for the business. It helps to fund the projects that are deemed art-house pictures sometimes. However, blockbusters, in this epoch of them we live in, don't endorse intelligence, good writing and film-making. One can appreciate the art of screenwriting and film-making by watching Memento and also understand the passion and devotion of the filmmaker. To say that Mr. Nolan's films lack human heart is a misnomer. The ideas he develops, which he later writes and directs are not ideas for the sake of ideas. The ideas of his screenplays are concocted, first and foremost, around emotion. Cobb, in Inception, has lost his wife since he's performed 'inception' on her. But, as the film moves forward, the viewer also learns that Cobb has been wanting to get back to his children. In Dunkirk, a war picture, despite the fact Mr. Nolan thinks it isn't one, is about survival. However, Dunkirk, when written, its idea and the shape of the screenplay circles around the incidents that takes place in the boat. The viewer witness three civilians, two of them minors, sailing toward the war zone. But tragedy strikes when one of the minors dies, unexpectedly and as well as unintentionally by the hands of a 'traumatized soldier' they rescue from the sea. Dunkirk is a complex picture, set in May 1940 as Germany advances in France, trapping the allied troops on the beaches of Dunkirk. It is intelligently written and directed. Like any other war picture it is not about the endorsement of the idea behind the war. 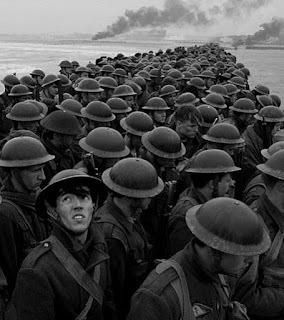 And it's understandable why Mr. Nolan claims it isn't a war picture. Rightly so to an extent, for Dunkirk lack bloodshed and politics. Instead, smartly, Mr. Nolan has taken advantage of the Hitchcockian method by giving rise to paranoia and tension. One can say that Dunkirk is Mr. Nolan's Lifeboat, a tense 1944 thriller by Hitchcock about American and British civilians who survive the sinking of their ship by a German submarine. However, Dunkirk is much bigger in scale. It's just the way Mr. Nolan like his films to be. This has been his comfort zone, his sweet spot, for some time. He adores the idea of his films being grand and that's why they turn out to be costly. But, they are costly and smart. Also, well-written and well-directed. Unlike the 98 percent of the blockbusters are released today serving no other purpose, but cash, Dunkirk is by a perspicacious writer and director from whom the viewer learns from. In the end, the finished work is equally entertaining and as well as successful at the box-office. Authenticity of Mr. Nolan has been always visible in his work of art. He wastes not his time, nor the audience. He understands that cinema has a purpose and he is its servant. Blockbusters, they don't have to be anti-intelligence. They can be smart, non-linear or linear, well-framed, written and directed to communicate effectively with the viewer. But its job should never let the viewer get sidetracked from understanding the purpose of cinema. Yes, not everyone is willing to understand the language of film, but everyone can still understand or at least get the idea of it, for a film should be able to interpret its language to the uninformed viewer and enlighten the well-informed even more.